Defense Secretary Mattis approves plans to extend deployment of active-duty troops at southern border until January 31. Row in lower chamber House of Commons centred on publication of legal advice related to British PM’s Brexit deal. The highly threatened subspecies has been brought back to a reserve in Niger after a 50-year absence. More than a dozen asylum seekers and activists go on hunger strike in Tijuana, calling on US to speed up asylum process. Doyin Okupe, former Senior Special Assistant to former President Goodluck Jonathan on Public Affairs, has declared that the All Progressives Congress (APC) does not have a presidential candidate for the 2019 general election. He stated this while responding to questions from journalists on the chances of the Peoples Democratic Party (PDP) and APC in the forthcoming election. He also lamented the refusal of President Muhammadu Buhari to sign the Electoral Act that has since been passed by the National Assembly. “Actions and activities of the Independent National Electoral Commission (INEC) are being dictated directly from the villa. If that is not the case, by now if the INEC Chairman was a truly independent person, he ought to have conveyed message to APC and the villa that they do not have a candidate for the 2019 presidential election,” he said. Okupe also added that evidence must be provided that the candidate had been educated to secondary school level. “As of today, the form submitted by Buhari to INEC does not contain a certificate. What he submitted is an affidavit with a false claim that his certificate is with the Army, who had sometime issued a statement that they are not in possession of any certificate of the president,” Okupe stated. According to Okupe, that by itself was perjury. “If I falsely swear to an oath that I am seven feet tall and measurement shows I am not that tall, I have simply committed perjury,” he said. He said such an invalidly nominated candidate had lost an election even before it is conducted, adding that it was incumbent on APC to either go to court or find another candidate. “Buhari is not a candidate for 2019 presidential election and the facts speak for themselves. By the action of Buhari to have gone to WAEC for an attestation showed that he knew that his certificate was never with the military and he swore to an oath falsely. That itself is ground for disqualification of nomination of any candidate. This is the truth and Nigerians needs to be aware of it, so that nobody creates crisis in 2019. Head or tail, Atiku will be President of Nigeria in 2019,” Okupe said. The governor has accepted the resignation of the two aides. The post 2019: Akeredolu’s senior aides resign, decamp to PDP appeared first on Premium Times Nigeria. 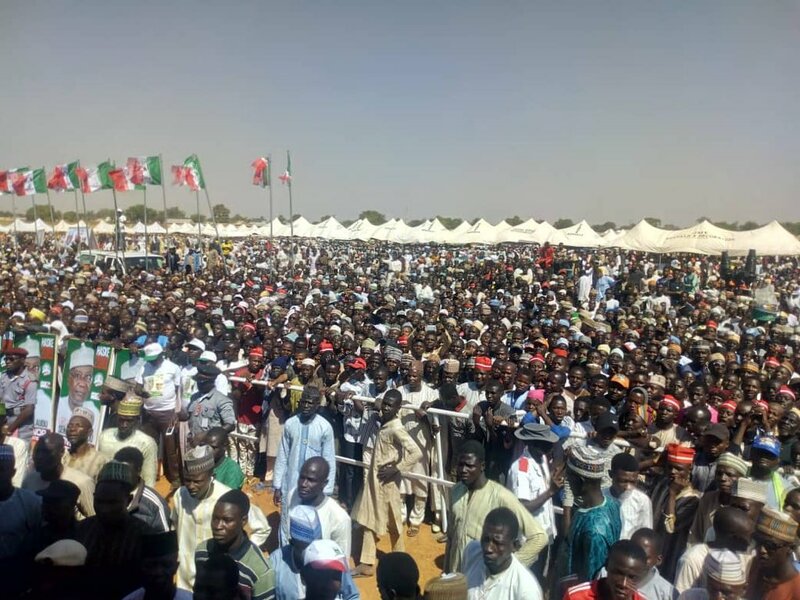 A group of youth under the auspices of the Arewa Proactive Youth Coalition has dismissed the flag-off of the Peoples Democratic Party (PDP) presidential campaign rally in Sokoto as the “latest form of MMM in town”. Inuwa Bako, President of Arewa Proactive Youth Coalition, urged Nigerians “to be wary of PDP’s ability to transparently manage public resources when it cannot be sincere with the number of people that took part at its rally”. His words: “The North-West rally which had the entire PDP loyalists from all over Nigeria left a 10,000-capacity stadium still empty and the mouthpieces of the party were still bereft of shame to lie that the number of people that attended the rally portends victory for Atiku (Abubakar). This is nothing but MMM whereby people were made to believe what did not exist. Anyone that allows themselves to be taken in by such scam is in for disappointing surprises. “The PDP may be playing the ostrich, but the reality is that many people that should have attended the rally are aware that they will not hear anything new, but that they will be plied with insult and abuses against the ruling party since the PDP and its candidate are incapable of issue based campaign. The people of the North-West and other Nigerians are eager to attend rallies that are better organised, where they will be able to hear fact-based pitches from candidates, and not gatherings where actors and charlatans would be hopping on soap boxes. “You can imagine that a party that was in power for 16 years with a candidate that was vice-president for eight years are unable to point to concrete projects or achievements to convince the electorate with. If after previously holding office for 16 years, all PDP can do is to make more promises of what it will do if elected instead of showing what it has done to be re-elected, then there is something capitally wrong with the party and its candidate. The workers’ protest comes weeks after legislative aides staged a protest in the complex to demand payment of salaries and other allowances. The post NASS Protest: Saraki, Dogara direct management to resolve issues by Friday appeared first on Premium Times Nigeria. Two top officials had earlier hinted on a possible out-of-court settlement. The post Repatriation of $8.1 billion Profits: MTN, CBN opt for out-of-court settlement appeared first on Premium Times Nigeria.